Coca Cola advertising on National Geographic magazines of the mid 1900s featured the renowned Santa Claus figure we all grew to love! 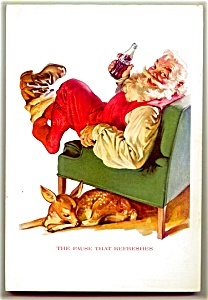 Here’s Santa enjoying a Coke as a tiny reindeer sleeps beneath his chair. We’re offering the entire December, 1958 magazine here -- uncut so it also includes many other great ads from the era. Articles here with more of the Geographic’s color illustrations, maps and photos cover topics as varied as NAVAJO Indians, the Aegean Isles, the Dead Sea Scrolls, and Ice Fishing! The issue’s "Special Supplement Map" is not present. There are a few minor scuffs on front cover -– the ad on back is without defects and ready to frame!